Spring Creek Correctional Center can house over 500 inmates. Originally this facility was designed to house maximum security inmates, but now houses a variety of custody levels. This facility has many treatment programs aimed at increasing an inmates problem solving and coping skills. 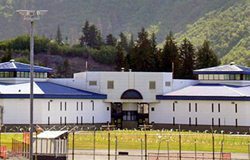 Spring Creek also offers substance abuse treatment and transition/reentry into society programs that prepare an inmate for their eventual release and reintegration with society. Spring Creek has many educational programs. While it offers the same adult basic education and GED courses that most institutions have, it also has advanced courses for inmates who are looking to earn their associates degree. Another program helps inmates to study for the CDL test that is given to anyone looking to obtain a commercial drivers license. Visiting applications for adults can be found here. The visiting application for minors can be found here. The inmate will need to inform you of your applications status. The visiting hours for general population inmates at this institution are Monday-Thursday from 1PM to 4PM, with Friday, weekend, and holiday visiting hours from 6:30pm-9:00pm. Segregation inmates have visiting everyday from 8:30am-10:30am. Every visit is a secure visit except for Friday, weekend and holiday visits where inmates in segregation can have contact visits.